Username or Password you entered is not correct. Please try again. A sub-account is similar to a regular IBackup account. Create sub-accounts using your account space to backup unlimited PCs, Macs and smart phones. Get an overview of all your sub-accounts at a glance! Create sub-accounts, allocate space, monitor activities and view backup reports, all from an easy to use centralized administrative console. You can create multiple sub-accounts, of any size, using your IBackup account space. The first 10 sub-accounts are free. Additional sub-accounts will be charged an annual fee of $20, per sub-account. The size of the sub-accounts is flexible; you can manage the space allocated to every sub-account. 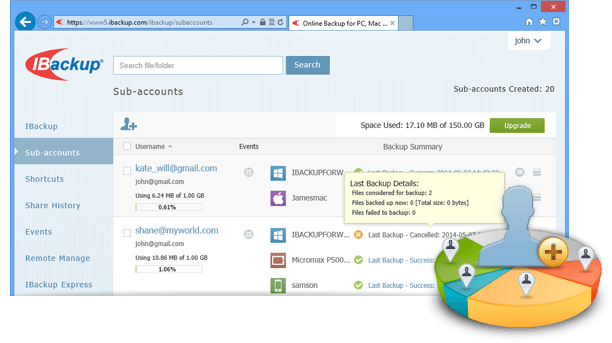 'Backup Summary' displays a summarized status for sub-account backups from all linked computers and mobile devices. You can also view detailed logs of backup activities via desktop applications for the last 7 days using 'Backup Report'. Keep track of the sub-account activities, performed using the web browsers. You can view details about login/logout activities, file operations like upload, download, share, etc. Protect your business data from all your computers and mobile devices using a single account. Data is encrypted on transfer and storage with 256-bit AES encryption with an option of user-defined key that is known only to you. We are available 24 x 7 via live chat, email and phone.